Being a fan of wordless graphic novels like Shaun Tan’s The Arrival and Thomas Ott’s The Number, I was eager to experience Chinese artist Daishu Ma’s Leaf. Like those previous efforts, Leaf is rendered in meticulous black and white pencil sketches. Unlike those others, spot colors, namely blue and yellow, are used as a narrative device. Leaf is about a single tree leaf that unexpectedly blows into the life of the book’s young, unnamed protagonist. Where thousands of similar leaves have surely blown by this young man before, unnoticed, this one has an inner yellow glow like no leaf he’s ever experienced. A fascination with his discovery sends him on a journey through the rather dystopian, labyrinthian world in which he lives as he tries to learn more about his pet leaf and then to try and recover it after it gets lost. You’re never quite sure exactly what is going on in Leaf and the meaning of the story is definitely open to interpretation. Some may find this “openess” in the wordless narrative annoying, but I really enjoy this aspect of such books. 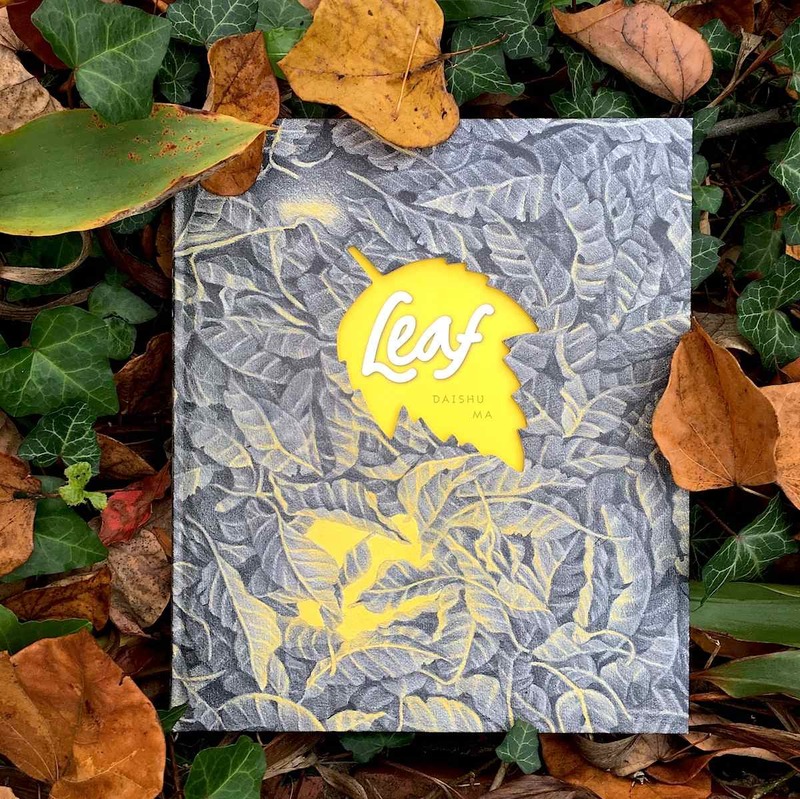 Leaf is filled with hundreds of soft pencil illustrations and many of them have a very touching, lyrical quality that effectively captures human emotion, community, memory, and the innocence of youth (as well as the dreariness of the world of Leaf). The artwork and book production are really beautiful and there is a gentle quiet at the center of this work that perfectly mirrors the muffled quiet of fall.